Running along the green forests of the upper Fascia Valley, through larches and fir trees, near the green walkway that stretches from Canazei to Campitello and Vigo di Fassa, Cesa Dolomia is synonymous with a warm welcome, both in terms of its name and of the position it occupies. Situated in one of the most peaceful, picturesque areas in the magnificent Canazei area, at an altitude of 1,440 m., you will immediately see the village as the perfect place to spend a happy, carefree holiday. 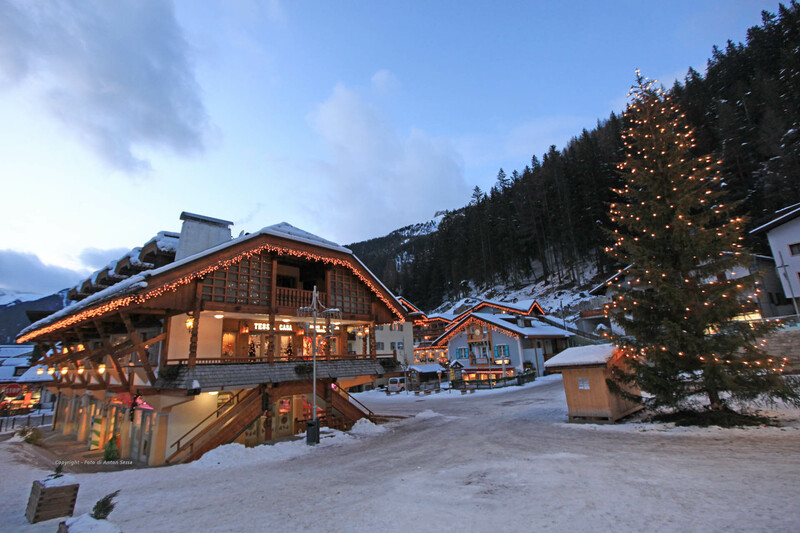 The apartments are located 200 metres from the centre of Canazei and only 500 metres from the Belvedere-ColRodella and Sellaronda skilifts. The nearest ski-bus stop is only 20 metres from our apartments. The Fascia Valley is the ideal destination for an alternative, re-energising, active holiday, and displays an irresistible charm all year round. Canazei in particular, is considered the ski capital of the Fascia Valley and now has a prominent place in the International skiing hall of fame. A holiday in Canazei therefore offers a wide range of possibilities in terms of entertainment: from a relaxing walk immersed in the pure, untouched nature of the green countryside, to exciting skiing experiences on no less than 800 km of slopes, served by state-of-the-art skilifts. By catching the convenient detachable skilift from the centre of village, in just a few minutes you will find yourself right in the middle of the biggest, most spectacular ski circuit in the world: the Sella Ronda. On the wide, sun-kissed bowl of the Belvedere area, thanks to the numerous custom-designed skilifts, it is not only possible to ski on the ski area itself, but also to join the famous Dolomiti Superski circuit, with 4 areas that can easily be reached from the village. The Belvedere, Ciampac, Col Rodella and Marmolada areas are in fact part of the wide range of facilities designed for the more avid skiers and snowboarders. The choices on offer are endless: the slopes range from easy to medium level, and up to the so-called “black” slope that is suitable for the more daring skier. In the summer, Canazei offers many possibilities for memorable excursions. The names of some of the Dolomite peaks themselves, such as Pordoi, Sella and Marmolada evoke the excursions and climbs that have made mountain history. Canazei also evokes memories of long ago: trips to a high altitude, pleasant strolls, picture postcard scenery, colours, sounds, flavours and fragrances. The most renowned village in the Fascia Valley is also famous for its houses which are coloured or painted like those in fairytales, and of course for its lively nightlife. One example of the facilities on offer is the Eghes Wellness Center, at the Canazei swimming pool, where water is the protagonist of a varied, reinvigorating wellness itinerary, conceived according to the ancient philosophy of the Roman “thermae”. The “G. Scola” Ice Stadium at Alba di Canazei, the scene of the ice hockey matches of the local team S.H.C. Fassa Levoni, is, as always the main venue in the National Serie A Championships throughout the winter and spring seasons. Canazei is also an important alpine skiing centre famous for its International sporting events, such as the Sellaronda Skimarathon in winter, the nocturnal Ski Touring race in the Dolomites, and the Dolomites Skyrace in summer, the World Championships high altitude ski race. Over the years, Canazei has seen a significant increase in tourism, but traces of its origins and the Ladin traditions are still visible in the architecture of the village and in its popular traditions. For example, in the month of July there is an event named “Te anter i tobiè” (in memory of the characteristic hay lofts that represent the historical memoirs of Fassana culture); these are opened to the public so that visitors can rediscover the crafts of times gone by. Then, each year at the end of August, all the Ladin valleys meet in the Fascia Valley at the “Gran Festa da d’Istà”, to celebrate the end of summer. It is a truly unique festival, where participants model precious costumes, shawls, hats, aprons, jackets and trousers that are painstakingly embroidered with patterns and in styles that differ from valley to valley. Therefore, in summer and winter alike, the enthusiast will find himself spoiled for choice. At Canazei, boredom is strictly forbidden!